From left: Sr. Executive Vice President Jesus Alfonso G. Hofileña, Vice President and Real Property Division Head Hector A. Caunan, President and COO Mona Lisa B. de la Cruz, Vice President and Finance Division Head Mylene C. Padilla, Vice President and Investment Management Staff Head Vera Victoria C. Morales, First Vice President and Legal and Corporate Services Division Head, and Corporate Secretary Atty. Renato S. de Jesus, and Vice President and Corporate Planning Staff Head Enrico L. Cordoba. 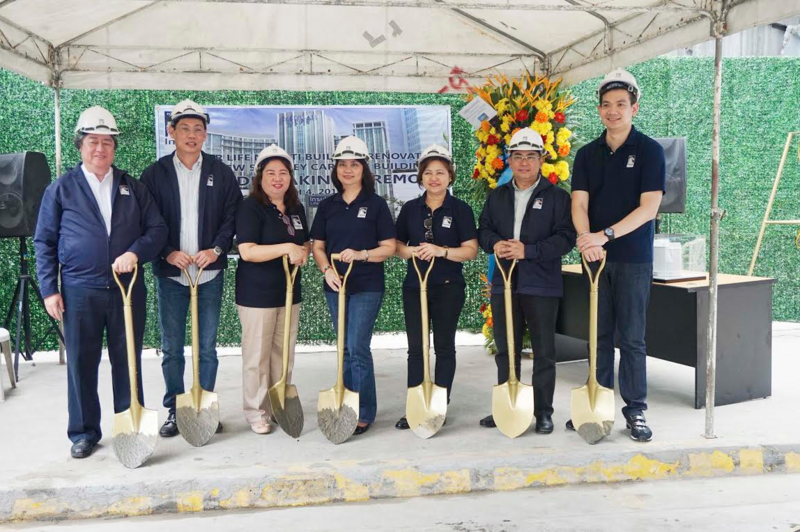 Insular Life held a ground breaking ceremony for the construction of the 5-storey car park that will be built immediately behind the iconic Insular Life building in Makati City. The building is now undergoing major renovation and modernization. Both will be completed by February 2017. Photo shows the Insular Life Makati Building Renovation Committee after the groundbreaking rite held for the 5-storey car park behind the new Insular Life Makati Building.